This beautiful gilt brass desk clock features red-brown gold brushed panels made to emulate the appearance of hard stone. 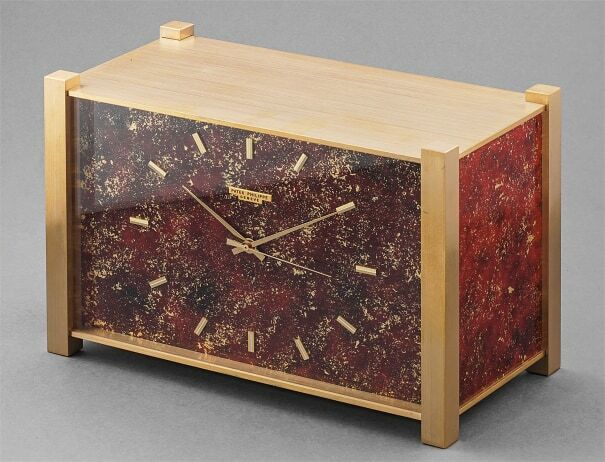 Full of 1970s flair, the panels showcase beautiful gold and copper specks that bring the desk clock alive. This timepiece is preserved in excellent condition with hardly any signs of wear. Furthermore, the lacquer is intact throughout. Patek Philippe has always been generous in providing resources for the advancement and research of technology and horology. In 1948, Patek Philippe inaugurated its Electronic Division, with the goal of innovating photoelectric and electronic timekeeping technology. In 1955, the firm showcased a solar-powered photoelectric clock at the World Symposium.